These days, zombies are everywhere: from television series, to movies, to books, even to television commercials. If you were to ask people how this craze got started, most would point back to the classic 1968 film Night of the Living Dead. A few of those people, with more knowledge of the history of horror fiction, would acknowledge the late Richard Matheson’s classic 1954 novel I Am Legend, in which a single human tries to survive in a world filled with vampires. If one broadens the definition of the “living dead,” however, the idea of a plague of zombies can be traced back much further, to the writing of none other than science fiction master H.G. Wells and his 1933 book The Shape of Things to Come! In the later years of his life, H.G. Wells had strong socialist political views and believed that humanity’s inevitable utopian future was to form a world government; much of his later writings reflected this belief. I have blogged previously about Wells’ 1914 novel The World Set Free, in which the world is forced into peace by the development of nuclear weapons. 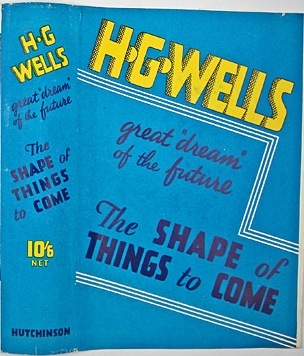 In The Shape of Things to Come, Wells takes an even more grandiose view, and predicts the future of the world from 1933 (the present, to Wells) to 2106. So what does this have to do with zombies? When I was researching the history of zombie stories for the introduction to The Face of the Lion, I came across a description of the plague Wells introduced in The Shape of Things to Come, the “maculated fever,” which strikes in the midst of war in the 1950s. That same dearth of detailed description which takes the colour out of the history of the last wars becomes even more apparent in the records of the epidemics that made any resumption of that warfare impossible. Diaries, letters and descriptive writing were out of fashion; there were other things to do and no surplus energy in the brain. It is as if the micro-organisms had taken a leaf out of the book of the Foreign Offices and found in mankind’s confusion an opportunity for restoring the long-lost empire of the germs. The attack began in the best style without a declaration of war. The first line of advance consisted of a variety of influenzas, impoverishing fevers, that were highly infectious and impossible to control under war conditions. The depleted strength of the belligerent populations, a depletion due to their reduced and disorganised nourishment and the collapse of their sanitary services, gave these infections full scope; they killed some millions and diminished the already lowered vitality of the great populations still further. That lowering of the general vitality was far more important than the actual mortality. Cholera and bubonic plague followed, and then, five years and more later, when the worst seemed to have passed, came the culminating attack by maculated fever. This obscure disease, hitherto known only as a disease of captive baboons, seems to have undergone some abrupt adaptation to the kindred habitat of the human body; possibly there was some intermediate host which prepared the bacilli for their attack on mankind. Or it may be that the preceding epidemics had changed some hitherto defensive element in human blood. We are still quite in the dark upon these points because at that time there were no doctors or biologists with the leisure to record observations, even had they had time to make them, and scientific publications had ceased to appear anywhere. So far, it sounds like an ordinary plague; the real connection to modern stories of zombies comes in the next paragraph. The disease appeared first in the vicinity of the London Zoological Gardens and spread thence with incredible rapidity. It discoloured the face and skin, produced a violent fever, cutaneous irritation and extreme mental distress, causing an uncontrollable desire to wander. Then the bodily energy vanished in collapse and the victim lay down and died. The fever was not simply infectious through water, but transmitted by the almost impalpable scabs scratched off by the sufferer. Wind, water and the demented sick carried it everywhere. About half humanity was vulnerable, and so far as we know now all who were vulnerable took it, and all who took it died. One terror which is never omitted is the wandering of the infected. Nothing would induce them to remain in bed or hospital; nothing could keep them from entering towns and houses that were as yet immune. Thousands of these dying wanderers were shot by terror-stricken people whom they approached. That dreadful necessity horrifies us to-day as much as that other grim act of self-protection: the survivors in the boats of the big steamship Titanic which struck an iceberg in 1912, beating at the knuckles of the drowning men and women who clung to the sides and threatened to swamp them. For awhile, under such desperate and revealing stresses, man ceased to obey the impulses of a social animal. Those of the population who resisted the infection—and with maculated fever the alternatives were immunity or death—gave way to a sort of despair and hatred against the filthy suffering around them. Only a few men with medical, military, priestly or police training seem to have made head against the disaster and tried to maintain a sort of order. Many plundered. On the whole, so far as the evidence can be sifted, women behaved better than men, but some few women who joined the looters were terrible. Similar descriptions might be appear in any zombie novel written today! Contagious, mindless beings wandering the countryside, breaking into houses and towns and infecting others. The uninfected members of humanity fighting back, shooting the diseased on sight. Society collapsing, and people devolving into a savage, animalistic survival state. Though it is not a true zombie novel, it is striking how much Wells’ short description of the plague of maculated fever reads like one. What can we make of this? I know of no evidence that later zombie authors/filmmakers were inspired by Wells’ description. To me, though, The Shape of Things to Come shows that apocalyptic zombie stories are much older than typically believed, and that fears of a “zombie plague” tap into very primal fears that have perhaps always been with us. Perhaps we can say that zombies are a truly archetypical and timeless monster, like vampires, werewolves and ghosts? Read the whole of The Shape of Things to Come at Project Gutenberg; the plague begins in Chapter 10.